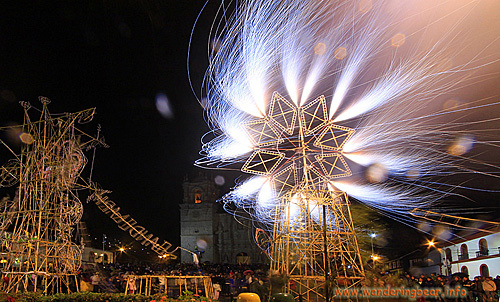 Andrew Dare reports from one of the greatest parties in Peru, the Virgen de la Candelaria festival in Puno.“The first 2 weeks of February sees one of the largest fiestas in South America in Puno, next Lake Titicaca – the spectacular Virgen de la Candelaria. It was then that the city of Puno was governed by Spanish magistrate Joaquín de Orellana and the city was under siege by the rebel troops of Túpac Amaru II. Fearful of the coming attack, the people of the city brought out the statue of the Virgin de la Candelaria and began a procession in which they danced, played their zampoñas (Pan Pipes) and lit candles. The massive noisy demonstration that lasted throughout the night confused the rebel army and they decided to leave the area. 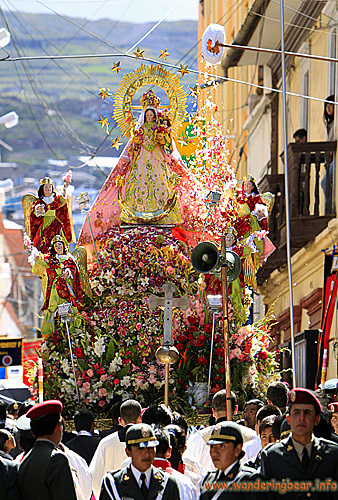 Of course in Puno this was seen as a Miracle and now the Virgin is venerated and held high as the Patroness of Puno, the event being celebrated ever since. The virgin in Puno was brought from Spain some time roundabout 1580 to 1590, probably having being made in Seville or Cadiz, as the materials used in their manufacture show typical Spanish construction, with a typical golden crown, haloed by sunlight & ending in many stars. 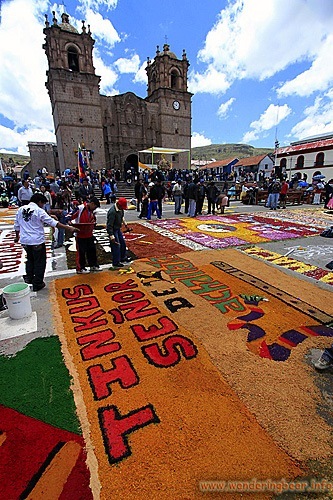 Today, the churches in Puno are decorated from ceiling to floor with huge cloth banners & thousands of flowers, & the centrepiece, the surprisingly small statue of the Virgin, receives rich & colourful new clothes for each year’s new fiesta. It’s hugely disrespectful to walk on these images, as this is reserved for the virgin, who blesses each images with her touch, as she is carried over it. Also as the virgin passes over each image, flower petals are thrown over the statue, as further blessings. It was interesting to see too that there were many ingenious groups had constructed special boxes on the end of ridiculously long poles, so they could accurately drop the flowers directly over the virgin herself, from the first floor windows & balconies along the route. I estimated there were in the region of 5,000 people involved during the procession, but this really is small compared to the main event, the colourful folk festival, which completely takes over the town & is just incredible. This properly starts on the next Sunday following the procession, with a huge “Dance & Costume” competition in the city’s stadium Torres Belon. Oscar Torres, director of the group “Devils and Dark”, estimates that just for the Sunday competition there will be more than 40 thousand dancers and 20 thousand musicians, in 73 dance groups. The competition started at 7:00 a.m. and although it officially ended at just after 6pm, everyone spilled out onto the streets & continued into the night, drinking Pisco, Rum & Chicha (corn beer), out of 2 litre coke bottles, well into the early hours. I could still hear bands at 5am in my hotel that’s some going. There were large cheers form the crowd about every 20 minuets, but not for the dancers, but the local Bomberos or fire brigade. 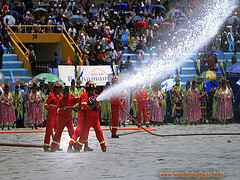 The sun was so hot that the fireman would hose the plastic covering over the grass down to cool it down, & the crowd being hot too, wanted cooling too. Not something I have seen anywhere else in my travels, but here the crowd loved it when the firemen turned their hoses on the stalls. 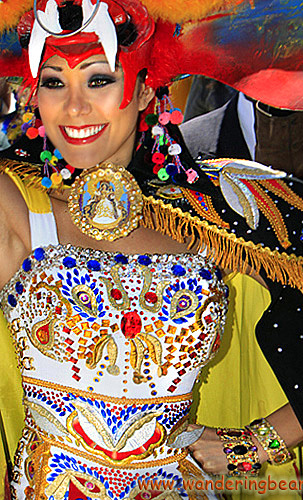 The former Miss Peru, Karen Schwarz, who in 2009 was the centre of a controversy between Peru and Bolivia for wearing a Diablada costume (claimed by Bolivia as theirs and only theirs), also attended the dance competition in her amazing costume. There were no complaints here, only huge cheers echoing round the hills. La Diablada dance (The dance of the demons) is dramatization of the legend between good & bad, which is presided by the archangel Micheal, and the Devil & his army, who is also accompanied by the “chinasupay” (the devil’s woman). The costumes are huge, being a metre & a half wide & together with a huge mask up to a metre high too. The big metal masks weigh so much, that only the strongest people are able to play the part of the devil, and having tried on a mask myself, I could only walk about with it for 2 mins before my neck complained & I had to give it back. The next evening is the day of the bands, and the volume is simply ear-shattering. They bands with 50 -100 musicians each, march round town, with many ending in one of the two plazas. Huge temporary scaffolding had been erected on one side of the smaller plaza, & here three bands played, while around the other sides a total of six other bands played their hearts out. Fireworks were let off, from huge castles built of bamboo, and to give an idea of the volume, I could not actually hear them, and I was so close, one of the band members actually had to put out the fleece jacket I was wearing, which was smouldering away from sparks landing directly on me! The “Grand Parade” takes place on the 9th February & is the height of the festivities. The groups, which paraded in the stadium, the bands, together with many more groups from the neighbourhoods, all return for a street procession in front of the Virgin, who will watch over them from a small tent erected especially for her, on the main street. The entire city turns out, either taking part in, or watching over the 5 kilometre parade through the city, starting from the shores of Titicaca & ending at the cities cemetery. This takes between 4-6 hours depending on the crowd. Groups tiring and not putting in 100% are jeered, while those doing well receive food, beer & home made beer called Chicha, passed out from the crowd. That usually gets an extra special show, until one of the officials tries to get them moving down the street again. Those who came to watch knew the score & are as serious as the dancers bringing a whole host of kit with them. From chairs, food, bottles of beer, chicha, to blankets for the evening when the temperature plummets together with umbrellas to keep the intense sun off, during the day. 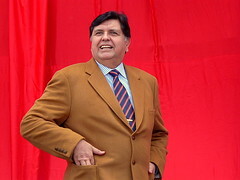 José Huanca Tonconi, the regional tourism director in Puno, is also one of the dancers in the group “Spectacular Morenada Bellavista”, boasting an impressive 1,500 dancers & musicians. 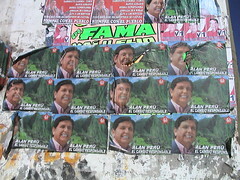 In the 2008 he conducted a survey among travellers arriving at the bus station in Puno between the two weeks of the event. 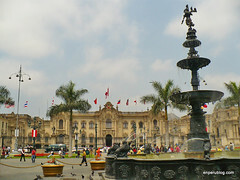 The study found that 42,842 visitors arrived in Puno just to attend the celebrations, with most coming from the cities in the south of Peru as far north as Lima, but many came from neighbouring Bolivia too. “According to the hotel figures in Puno, in February 2009 Puno received 19,424 visitors, of which 9672 were domestic tourists and 9752 were foreigners”, said Huanca. 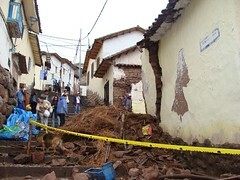 This year there was a noticeable lack of foreign tourists, as the floods of Cusco & closure of Machu Picchu had obviously affected many people’s plans. In the two weeks I only saw about 25-35 foreigners, which is a huge shame, as this is such a huge & colourful event, & so well worth visiting. In the first dance competition organized by the Governors of Puno on 2 February 1954, there was only 14 groups or neighborhoods. By 1995 was 65, and now there are more than 120. Its interesting to see the power of the festival, as to be incorporated as a new neighbourhood in the community, two things have to be achieved. First involves organizing a new dance group for the Candelaria, and the second is by building a new cross on any of the neighbouring hills, and then this is followed up by some local administrative paperwork. 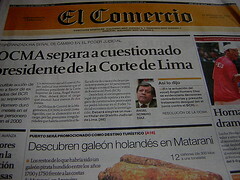 Candelaria is that important here! Today the vast majority of costumes are made directly in Puno, the embroiderers say they have the capacity to meet demand for the dancers of the Candelaria as well as other festivities in the region. Candelaria for these artisans is like a huge fashion show, where they exhibit their innovative & creative work, and take on orders for the following year & other groups. 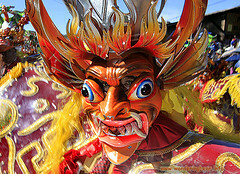 A single costume can cost several hundred dollars, which is a very large percentage of the annual salary in the region. And with a dance group being several hundred people, the embroiderers have their work cut out for the year. The mask makers are an important part of the towns business & fame too. Until 1950, the most famous mask makers were the brothers Alberto & Ramon Velasquez Laykakota Quarter using traditional methods but producing very heavy masks. But from the early 60s new methods using other materials such as brass were introduced, pioneered by Blackut Luis Trujillo, originally a Bolivian, but resident for many years in Bellavista, in Puno. Today there are many mask makers in Puno, & the only real limiting factor today, is how big & thus, how heavy, you can actually wear all day. There has been a slow evolution of the costumes too, with the most famous, the Diablada, started with just a few staggered embroidered figures, perhaps having some Inca history behind them. Today these costumes are embroidered with Chinese dragons & snakes, having a strangely Eastern mythology & flavour, which seems a bit odd, high in the Andes of South America. This has been a result of Japanese and Chinese immigrants, who began settling in neighbouring Bolivia, & bringing their embroidery skills together with a mixing of their culture. The final event of Candelaria, is a music parade with some 1,500 musicians & dancers, consisting of 15 sicuris groups, consisting of about 100 people in each band. The sicuris is a type of traditional panpipe, consisting of two rows of reed tubes 8 in the front row & 7 in the lower second row. 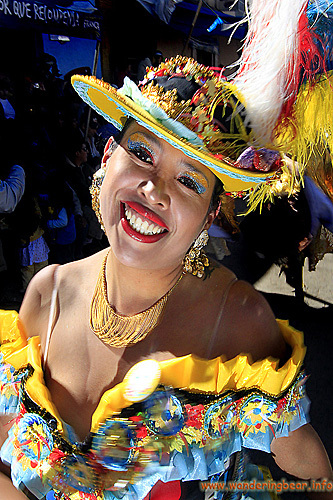 “Most of the sicuris groups come from the city of Puno, with only a few from different regions, & together contribute to the enlargement of this art, & promoting the native culture more & more” reported Yenny Silva Quispe, the event organizer and president of the Regional Federation of Folklore and Culture of Puno. Although the Virgen de la Candelaria festival officially ended on Wednesday 10th with the sicuris parade, there are always groups that can been seen & heard in the main streets during the following weekend. This year too, with carnival being on the following weekend, the celebrations simply continues into one huge three week party – Massive!